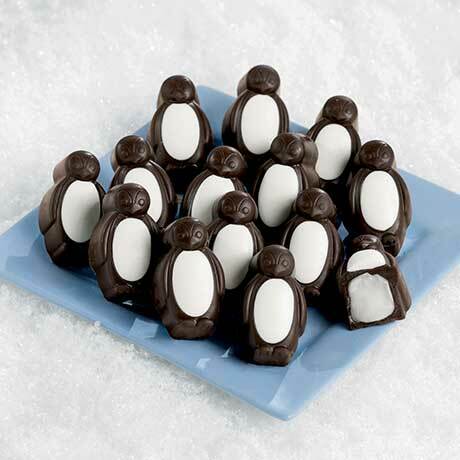 Dark chocolate Penguins filled with frosty mint. 6-ounce box. Please note: Shipping may be delayed until temperatures drop below 80 degrees. May contain: Peanuts, Tree Nut. Dark chocolate (sugar, chocolate, cocoa butter, anhydrous milk fat, soy lecithin, vanilla), white confectionary coating (sugar, hydrogenated palm kernel, nonfat milk powder, soy lecithin, monoglycerides, artificial color [titanium dioxide], artificial flavor), soy lecithin, hydronated plam kernel, pepperment oil.